When you think of rugby league hotbeds, you might call to mind England, Australia or New Zealand, but Turkey might not be very high on the list. However, Salford Red Devils back-row Jansin Turgut recently played for the country, which is currently ranked 31st in the world. 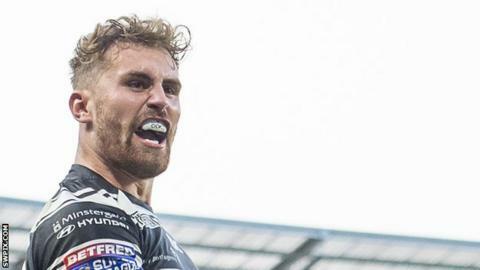 The 22-year-old, who initially joined Salford in August after four years with Hull FC and later signed for the Red Devils for 2019, qualifies for Turkey through his father. Turgut was part of the Turkey squad that participated in October's 11-team 2018 Emerging Nations World Championships in Australia, where they won three of their four games. "Somebody got in contact with me at the back end of last year. I had the opportunity to play for them and I went to Australia," he told the BBC. "I felt privileged to be able to represent my roots and make my family and dad proud." Turgut continued: "It's a chance for the teams that can't quite make the World Cup. At the time, Turkey didn't have a ranking and they needed players. "Japan, Malta and Greece were in the competition, a few countries you'd heard of but maybe you didn't know they had rugby league teams and it was a chance for them to showcase themselves." With his family back in Turkey watching, Turgut featured as one of just a handful of players in the team who play rugby league professionally. "Some of the players had not played before, some were Australian with Turkish roots and there were a few lads that were from Turkey and play there as well," he added. "There was a mixture of levels and we all tried to play at a baseline and it was quite difficult getting used to it but we got a couple of wins and it was a family, cultural feel around the team and that was nice. "I'd definitely do it again. All the boys are keeping in contact so it was nice to be able to do it."